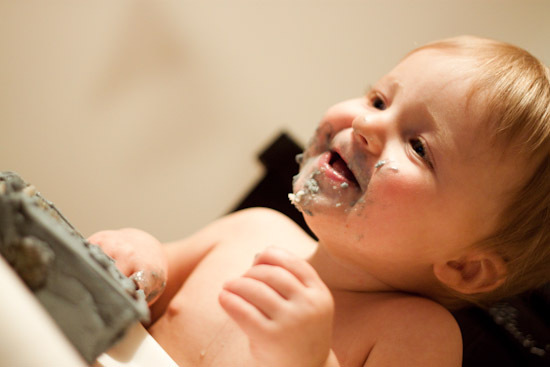 There is often a little controversy when trying to decide what to do for your child's first birthday. After all, they are most likely too young to remember anything special that went on that day. 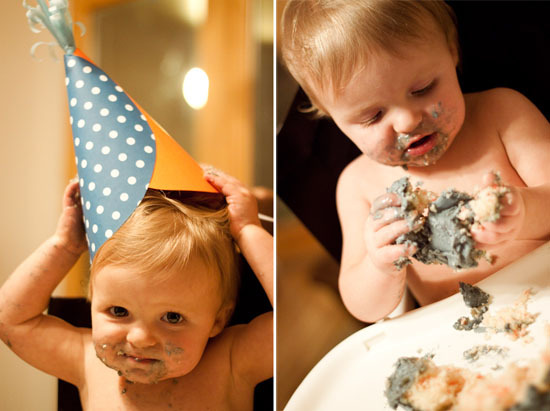 And spending extra effort on an awesome birthday cake seems a bit much, considering the fact that all they could care about is that it tastes extra yummy to their tummys. 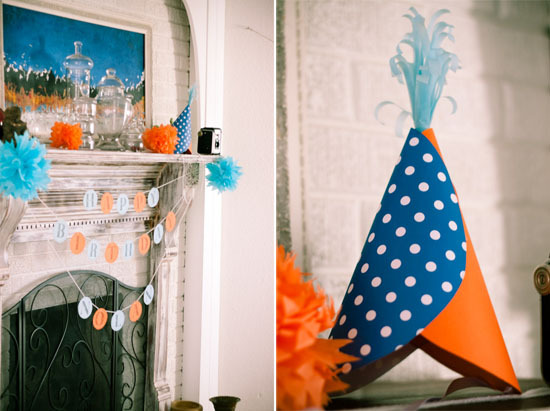 Instead of weighting out the pros and cons, I decided to go all-out for my little mans 1st birthday. 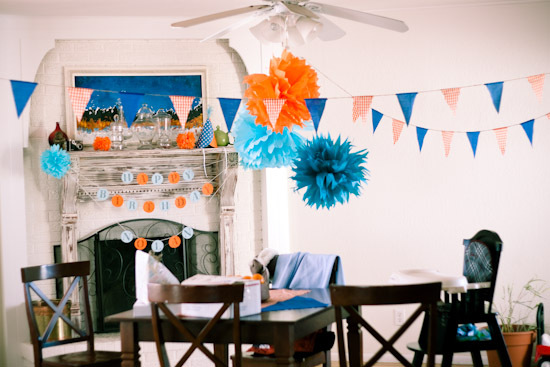 I had tons of fun finding creative inexpensive decor ideas and my little man was surprisingly interested in all of the fun decorations. 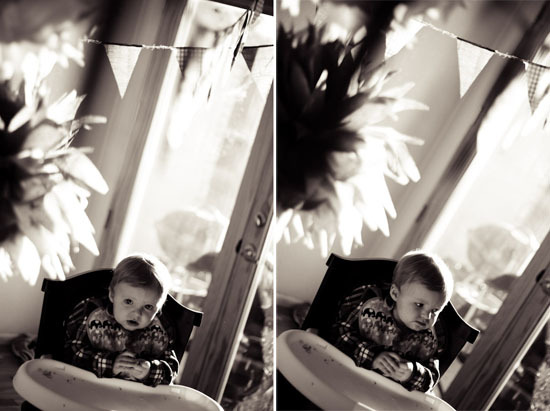 Most importantly he had a great day and an awesome party and now we have memorable pictures to look back on. *I hand picked candy pieces from the local candy shop, instead of buying more then what I needed in full packages. 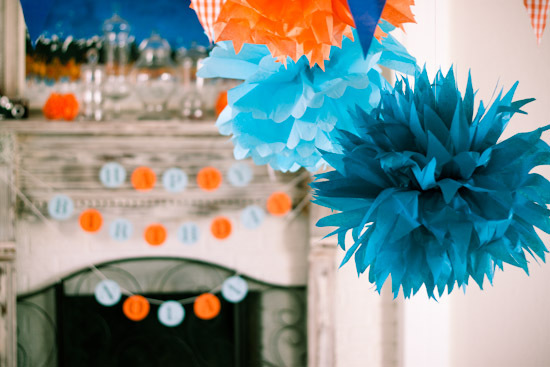 A big thanks to Martha Stewart for all the fun ideas for kids birthday parties. 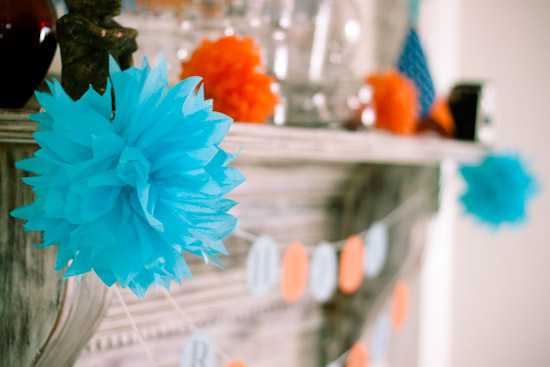 These are the ideas I used: Party Hat, Happy Birthday Garland, Floral Pom Poms, Flag Streamers. While flipping through one of my favorite books "Whats New Cupcake" a sister book to "Hello Cupcake," I discovered a super cleaver design for a robot cupcake cake. Because cake design is more my specialty and I wanted my son to have a larger piece of cake to dig into, I decided to take the idea and turn it into an actual cake. 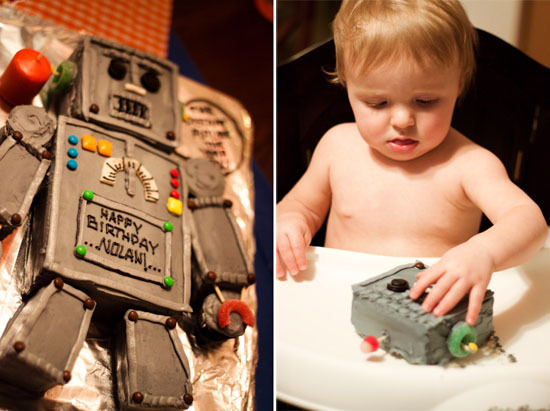 Click below to get the how-to for the robot cake! Bake 1 Betty Crocker (or other) cake mix according to package directions in a 9x13 pan. Make sure to grease the bottoms and sides of the pan with shortening and then apply a light coat of flour over the shortening. This will allow the cake to come out of the pan better then just using cooking spray. Allow cake to cool slightly and remove cake from pan. After cake has cooled completely place in the freezer overnight. 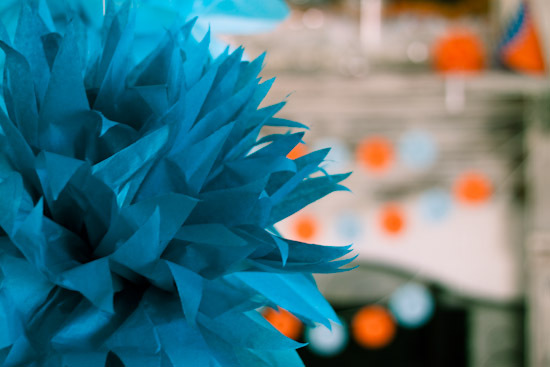 Hardening the cake will allow you to make cleaner cuts to create pieces for the robot body, but if you are a skilled cake decorator you can simply make your cuts after the cake has cooled. Take cake out of the freezer and let thaw just enough so you can cut with a knife. Cut about a 5"x5" square piece of cake for the head, 8" x 6" triangle for the body. use the remaining pieces to cut 2 small rectangles for the arms and 2 small rectangles for the legs. After the peices are cut, apply a crumb coat of frosting to each piece then let sit in the refrigerator to set. I used homemade frosting for this cake and simply colored it grey with food coloring. Cover a large baking sheet (or other flat object) to use for a base to assemble robot on. Apply a 2nd and final coat of frosting to each piece of the robots body and carefully assemble each piece on the baking sheet to desired robot shape. Now have fun! Use various candy pieces like mini m&m's, chicklets, black liquorish strands, and gum drops, candy jelly rings, or other candy items to create facial features and buttons. 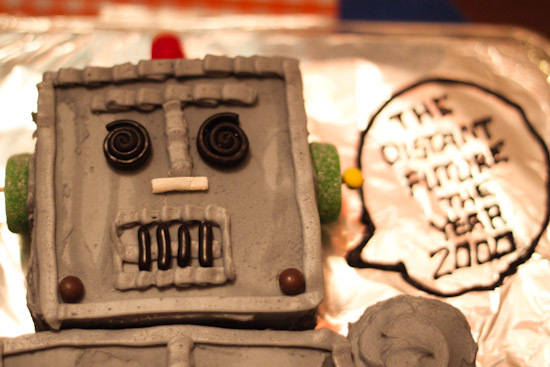 Fill a pipping back with the leftover frosting to detail the robot, just have fun with it! Note: I used extra mini cupcakes with cut candy jelly rings and toothpicks for the robots hands. But, if your looking for a more simple design you can skip this step. I like the little homage to FOTC. Great cake.